One of Anh’s favorite styles to cut — a choppy fringe! 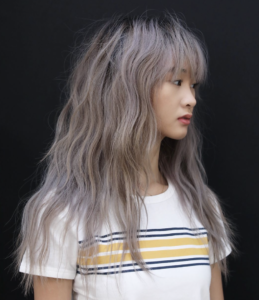 This model’s longer, romantic lavender grey hair is prepped first with L’Oreal Professionnel 10-in-1 and Mythic Oil for hydration and protection on color treated hair prior to being blow dried smooth with the Dyson Supersonic and an Ibiza round brush. Anh prefers to cut dry hair to take into account the client’s hair texture and the way it naturally falls. He detailed the bangs by point cutting the edges to give them movement and ensure they grow out natural and lived-in looking. To style, he waved the hair using the Nu Wave technique and finished off with Architexture for separations on face framing strands and the edges of the bangs.